On this blog, we’ve long been advocates for improvements to our broader transportation system, against further parking expansion, and against ugly parking garages. We even calculated several years ago that 25% of our urban core is covered in surface parking, a sad fact that reduces our city’s walkability, vibrancy, and economic activity. At one point, these anti-parking screeds led the Spokesman‘s Nick Deshais to describe me as “railing against the parking situation in the City’s core.” Indeed! Which is why I must express caution about this study. To be sure, there are probably some short-term and mid-term improvements to the experience of individual parking users that could be gleaned from this work. Information signs, wayfinding, and better utilization of existing parking all sound great! But in the long term, we cannot park (or drive!) our way to a human-centered, unique, vibrant, and pedestrian-oriented downtown. Instead, we should be working to reduce single-occupancy vehicle trips, through robust commute-trip reduction with dedicated funding. (Seattle has drawn national acclaim for its work in this field.) We should be subsidizing transit passes, providing bike lockers and showers, and developing smart employee assistance/family emergency programs. As ridesharing and driverless vehicles continue to take off, we should be planning for drop-offs of both autonomous and non-autonomous Lyfts/Ubers/taxis. And perhaps most critically, Downtown Spokane has the highest concentration of transit service of any ZIP code between Seattle and Minneapolis, and yet clear untapped ridership potential. We should be providing more transit options, more often, from more places in our region. We should be expediting the Central City Line and other high-capacity transit routes from more places in our city. And yes, we absolutely should be discouraging employers from subsidizing parking––and suggesting that they redirect those benefits into free transit passes. Finally, we should focus on creating human-centered places––not designing around cars. It seems every couple months we’re replacing a historic building with a parking lot, building a new parking garage, or adding street parking in increasingly convoluted and vehicle-centric ways. Could we be missing opportunities for smart infill, transit-oriented development, open space, and plazas? At the end of the day, we hope that this survey carefully considers the parking situation downtown, without relying on the absolutely false premise that everyone has to drive to get there, and have a completely hassle-free experience when they do. That’s the type of flawed logic that led to the vehicle-oriented 1960s-era Ebasco Plan for downtown. It’s what caused local leaders to flirt briefly in the 1990s with a Lincoln Street Bridge directly on top of Spokane Falls. And it’s what led the Westside to create a completely vehicle-oriented core in downtown Bellevue. 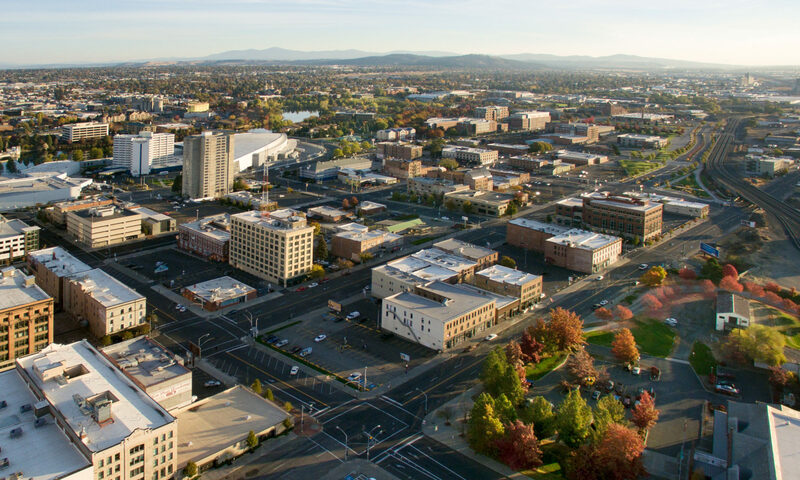 Ultimately, we can do better in Spokane––if we plan carefully and think critically. We deserve a downtown designed for people. Not cars. SHARE YOUR THOUGHTS: What do you think? Should we be doing more to enhance the experience of parking downtown? Do we need to more heavily commit to commute-trip reduction and public transit? And do you think Spokane should be designed foremost with people in mind? Share your thoughts in the comments below, on Facebook, on Twitter, or in person. We love to hear from you!